Gold is in Uptrend - Is it Right Time to Accumulate? The Brexit crisis has given gold a new lease of the life and as a net result gold is in uptrend and has crossed 52 weeks highs. whenever uncertainty rises in the world gold becomes the pet darling for the investors and thus demand increases as compared to supply and thus price rises. 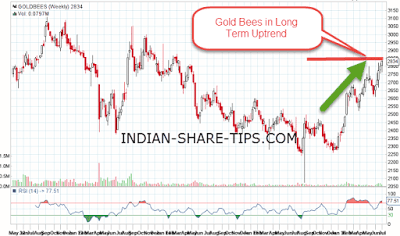 As we can see in the below image of Goldbees we find that gold is in uptrend as can be seen in the annotated chart for past 5 years. You can check Goldbees live price here and can check live gold rate here. Nonetheless; as we see that gold will remain uptrend till the time it sustains above 30000 mark and with Diwali approaching we can see it attaining new heights. Do remember to check our hot stock of the day here and make money like professionals in intraday market as it is easier to make money in Indian equity market as its size is small as compared to the commodity market.